Summary : This tea is a green tea purists nightmare. It looks like no green tea I've ever seen, and has a pretty nasty aroma too. The flavor isn't that great, either. Review : During my last order with Culinary Teas I did what I normally do when I order tea...I more or less ordered "randomly," getting some teas I thought I would like as well as some teas I've never even heard about before. And that is how I came to possess a sampler package of their Hojicha Gold Green Tea. Well, what a surprise this tea turned out to be. First off, the leaves of this tea are brown. In some ways it almost looks like shredded tree bark or something. Yet, I won't judge a tea by it's looks. 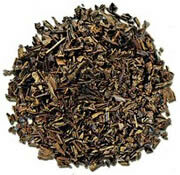 The reason for the brown tea leaves, by the way, is because the green tea leaves are fire-roasted. But then the aroma of this tea hit me. All I could initially say was, well...unpleasant. The aroma had a roasted smell about it, really almost a "burnt smell" about it. After my very unpleasant tasting experience with the Japanese Genmaicha Tea, this was not a good thing. Yet I'm a survivor so I pressed on. Here is how Culinary Teasdescribes this tea : "The roasted green tea takes on a full bodied character with almost cinnamon toast-like notes. Delicious character that many tea drinkers enjoy." Once this tea is brewed, rather sadly, the aroma of the tea didn't go away. Indeed, it may have even become stronger. As such, when drinking this tea...even before I sipped it...I had the peculiar feeling that what I was about to drink was "burnt water," strange as it sounds. And really, the flavor of the tea even seems to be a "bit burnt." Of course, in reality, the flavor is roasted, not burnt. But yet, when tasting the tea...there isn't a huge difference between "roasted" and "burnt." Now admittedly, I'm not a fan of things "roasted." So it was probably no surprise that I would not like the flavor of a green tea whose leaves have been roasted. The reason I mention that is because this tea does contain high quality tea leaves, similar to other teas that Culinary Teas has. Thus, I guess what I'm saying is that if you like "things roasted," in particular roasted coffee, well...perhaps you will like this tea to some degree. Indeed, the aroma of this tea even reminded me a bit of a weird coffee. That said, if you are looking for a more traditional green tea, you will NOT find it here. Recommendation : No. The combination of the rather nasty aroma of the tea, along with it's "roasted flavor," I found quite un-appealing. I suppose if you like things "roasted" you may enjoy this tea to some extent, however.